On Saturday, 9 August 1941 the unthinkable happened: the legendary Fighter leader Douglas Bader failed to return from a mission over northern France. Immediately, without thought for their own safety, the fiercely loyal pilots of his Tangmere Wing set out on a sweep to search for him, hoping that he may have successfully baled out into the Channel. By nightfall, however, there was no sign of him and everyone feared that their famous Wing Leader might have been lost. A few days later, however, the good news filtered into Tangmere; Bader, renowned as the Fighter Ace with artificial legs, had survived, albeit as a prisoner of war. 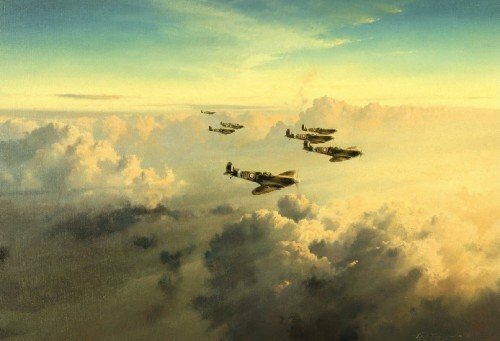 Robert Taylor’s famous painting portrays Spitfires of the Tangmere Wing flying a southerly course towards the Pas de Calais and a doubtless engagement with Adolf Galland’s ‘Abbeville Boys’. The glorious colours of sunrise glint on the sleek fighters as they streak out over the early morning cumulus clouds. The painting depicts a peaceful prelude to what will inevitably become an intense dogfight for the younger pilots and takes its unusual name from the witty message chalked up on one of the Wing’s notice boards – ‘Bader’s Bus Company – daily tickets to the Continent – Return tickets only!’. Every time the mercurial Wing Leader crossed the French coast he would announce: ‘Bader’s Bus Company on time’. The original lithograph edition, which was personally signed by pilots from this famous unit, are long sold out and will always remain in great demand. However, thanks to the latest high-technology Giclée process, collectors can at last enjoy this much admired image on canvas through the release of these new Studio Proofs. Each canvas is hand-signed by the artist Robert Taylor, stamped on the back, hand-numbered and issued with a Certificate of authenticity.